Last spring when one of our team members became ill she requested that blankets and books be given to children’s hospitals throughout our community to bring cheer to children who are suffering, and quite probably bored while lying in bed in a hospital. Wonderland BookSavers has been raising funds, creating Knot-Yet-a-Blanket kits, packaged with books, and distributing these gift bags to the Child Life teams in pediatric hospitals in which various team members and friends have been patients. Partnering with Wetherbee School in Lawrence Massachusetts, dozens of children from this Title I school have been able to participate in their own “service project” by creating amazing paintings for our gift bags. We were excited to return to Dartmouth-Hitchcock Hospital in Hanover, NH. The team at CHAD, Children’s Hospital at Dartmouth-Hitchcock, is terrific., and they took great care of one of our team members. We are happy to be able to contribute to the CHAD Child Life Program. When planning our goals for this year we reflected upon some unexpected medical challenges that our team members recently encountered. These experiences increased our sense of vulnerability and deepened our appreciation for expressions of random kindness from others. We decided that this year, in addition to donating books, we really wanted to reach out directly to children who are hospitalized. We know, from personal experience, that kindness really matters and small gestures of compassion have great impact when everything else seems out of control. In previous years we have donated blankets, as well as books to children’s organizations as well as to immigration service organizations. This year, after several extensive hospital stays by different WBS team members, we decided that entertainment, as well as comfort would be the way to go. And so we developed the idea of Knot Yet a Blanket kits, a blanket kit that child patients can easily make themselves while resting in bed. The patterns are bright and friendly. The fabrics are soft and warm. We want the blankets to be safe and clean, so we make them in a pet-free, sterile environment and then seal them in plastic. But we want to make the packaging fun so we paint all the bags by hand. In fact, we sent 100’s of bags to different schools to be painted by students in various Art Departments. These bags will be sent back to us in April. Our goal, as always, is to have as many kids as possible participate in our mission. Painting bags provides the perfect opportunity for all our Title I schools to partner with us and help make a meaningful contribution. And since we are all about literacy (always!) we include a book! Our very first blanket went directly to our favorite-of-all-time-best-ever children’s librarian, Susan. Our prayers are with you, Susan, every minute of every day. We are here with you, awaiting your miracle. Our first Knot Yet a Blanket & Book donation has gone to Lehigh Valley Hospital Muhlenberg Campus Pediatric Oncology/Hematology Ward in Allentown Pennsylvania. Shannon, our WBS friend and long-time volunteer with the pediatric oncology program will share them with the patients during their chemotherapy sessions. We are scheduled to make our next Knot Yet a Blanket deliveries to Yale-New Haven Pediatric Hospital in New Haven Connecticut, Sloan Kettering Hospital in New York and Dartmouth-Hitchcock Hospital in Lebanon New Hampshire. These will be delivered in April. Unlike our book donations, blankets are not recycled, and so we need to raise funds for this project. Each blanket has a tag from the sponsoring donor, handwritten by Reid. We would love to have you have your donation and send your blanket on with love! Please consider joining us in this mission! You may send your blanket (s) in the name of someone you love. Kindness counts, we know from personal experience! We have been fortunate to be supported by many wonderful organizations, one of which is St. Thomas Aquinas Parish. Father Martin has provided us with the opportunity to speak at 4 Masses this weekend. We want to thank the parishioners for their very generous support as they have donated 1,000’s of beautiful children’s books these past few years. We also want to reflect upon our growth, which we feel is like the parable of the Mustard Seed. We are of very small beginnings, but with humble faith, we continue to grow and make room for others to come rest in our branches. My name is Andre /Brooks and Father Martin was kind enough to allow my friends and me to share with you the adventures of our community service book club, the Wonderland BookSavers. These words proved to be more true than we could have ever imagined. Claire: We feel that expanding access to books will help to increase global literacy, allowing children to grow into adults that can have more meaningful lives, and will provide the opportunity for more people to follow Christ, through their ability to read the Bible. Our own reading of the Bible has taught us, “For I can do everything, through Christ, who gives me strength.” Philippians 4:13. The Wonderland BookSavers, now an official international 501(c)3 charity, began five years ago with the simple ambition of using literature and Christ’s love as an inspiration to serve our community. Our initial goal was to donate 500 books to a local school. We have surpassed our expectations by donating over 140,000 books, 1,500 pairs of shoes and countless supplies including blankets, school supplies and Band-Aids to kids around the world. With inspiration garnered from literature and from the love of Christ, we now regularly fill libraries in Haiti, Honduras, Peru, Ecuador, China, Ghana, Zimbabwe, Rwanda, Uganda, Kenya and South Africa. We do not neglect our immediate community, providing supplies to kids in Bridgeport, New Haven, Newtown, Massachusetts, Appalachia West Virginia and Tennessee. We are extremely grateful to our adult partnering organizations. They provide shipping and trucking to remote locations. Of course our most important partners are people such as yourselves, sitting right here at Mass today. The children that receive our donations, both locally and in South America and Africa are so grateful for your contributions. It is hard to understand sitting here in Fairfield today, but something as simple as lacking a pencil or a pair of shoes, can prevent an African child from attending school. Maddie: We compare the growth of our charity to the parable of the mustard seed in the Bible, Matthew 13:31-32. We planted our seed with the simple step of taking action. With humility inspired by Jesus, who died on the cross for our sins, we have gratefully watched our seed grow. In the process, we have learned some things that we had never imagined. Do you know what a teacher does in Zimbabwe when she gets a new box of pencils? She breaks them all in half, so that every child can have one. Did you know that many African children walk barefoot to school, sometimes 5 miles or more per day? Did you know that Jesus lives in Zimbabwe? We received a package of drawings and letters this year from children in Zimbabwe, thanking us for their books, and every single letter referenced Jesus, saying, “May the Lord bless you for your kindness.” We truly felt blessed by their words. The most important lesson we have learned is that charity does not have to involve collecting money. In our society, we leave books on shelves collecting dust, we have old shoes that are “two sizes too small” cluttering up the back of our closets, we have random crayons, pencils, markers rolling around in our drawers. These are all opportunities to bring joy to a child. We fill shoeboxes with Baggies filled with all kind of marking tools. One shoe box like this, (show box), contains enough school supplies for an entire classroom in Africa. Please help us continue our mission by simply gathering books, shoes and crayons you no longer need, and donating them so another person can enjoy these items. Together, we can increase global literacy and help the mustard seed of faith and charity grow in our hearts. Emma: We would like in turn to thank you, the parishioners of St. Thomas. You have been so exceeding generous these past two years, donating numerous children’s books, school supplies, pens and pencils. These gifts have been truly appreciated. In September 2015, Father Martin was kind enough to allow my friends and me to share with you the adventures of our community service book club, the Wonderland BookSavers. At that time we were proud to have donated over 30,000 books to children across the globe. Now, with the support of Father Martin and you, the parishioners of St. Thomas Aquinas Parish, who have generously supported our efforts, we can say that together, with Jesus at our side, we are truly spreading the gift of literacy. 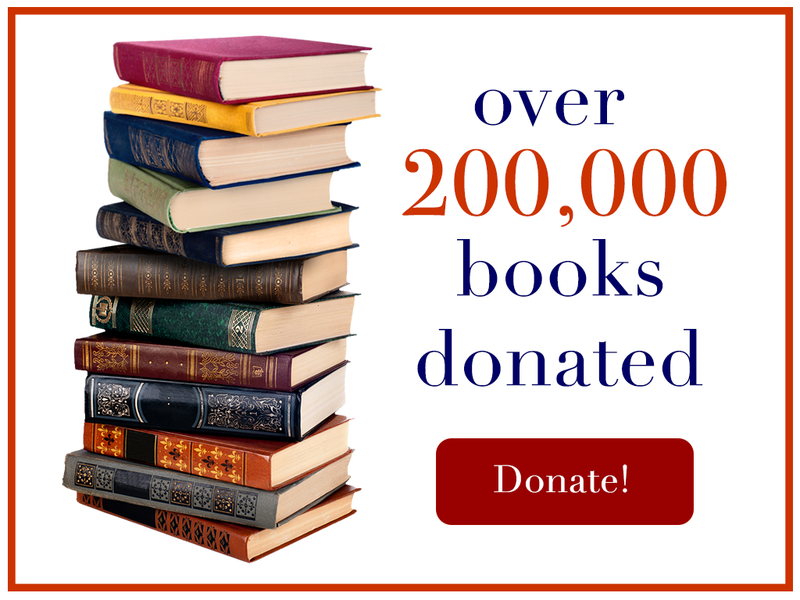 In just the past 2 years we have shared over 100,000 books with over 500,000 children in over 14 poverty-stricken regions throughout the world. These children are learning to read and grow and will be able to build meaningful futures for themselves and their families. On Friday morning, Madeline, Emma and I led a tour at Pequot Library, entitled the “Poe and Witches Exhibit”. The exhibit was centered around the theme of imagination and idealization, especially in reference to the writings of Edgar Allan Poe and the Salem witch trials: perfect topics, as Halloween is just around the corner! When the elementary school class from a local town arrived, we began an architectural tour, as it is important to appreciate the unique patterns, art, and craftsmanship that can be seen throughout the library. On the library’s exterior, there are often overlooked dates chiseled above the arched, pink granite entrances, which read 1637 and 1887. The latter represents the year of the library’s opening, and the former represents the year of the first recorded event in Southport, Connecticut: the Great Swamp Fight. The battle marked the ending of the Pequot War, and it is believed by experts at the Mashantucket Pequot Reservation that many artifacts still lie beneath homes and wetlands in the surrounding area. As we continued to lead the group of children throughout the library, we arrived at the “stacks”. Originally donated by renowned town philanthropists, the Wakeman family, the stacks still house adult books in the extensive rows of books, which are bejeweled with Tiffany glass windows. The upstairs of the stack, which was most students’ favorite part of the tour, has a thick glass floor and retired gas lines, which, historically, would provide light for the readers on the floor below as evening fell. After the architectural tour, we lectured the students on the witch trials of the 1600’s. Though most of them had heard of the Salem witch trials, they were surprised to hear that Fairfield has a dark history of trying and dunking or hanging accused witches. After discussing the significance of primary sources with them, we read aloud from a book in the display case that entailed the ideas of witch trial proponents Increase and Cotton Mather. In relation to the theme of imagination and idealization, we discussed with the students how the imaginations of the people at the time, who had little proof of cause if anything went awry, might be fueled by influential writers such as the Mathers, or town leaders such as Rodger Ludlowe. Additionally, we discussed how the term “grim” is applicable to both the trials and Poe’s works, and how thematic parallels can be drawn despite the difference in time period. We finished by conversing about our current idealization of witches; how we imagine them to be evil with green skin and a pointy hat, or kind and fairy-like, as Glinda is portrayed in the Wizard of Oz. Following out tour of the witch exhibit, we transitioned into Perkins Gallery to explore imagination and idealization in the context of Edgar Allan Poe’s short stories. Specifically, the focal point of the exhibit was Poe’s dark imagination, and what he triggered in our own imaginations, as well as others’. Alongside his own works, many of the artifacts were renditions of some of his famous works, such as cartoon posters of The Raven, a miniature cat jack-in-the-box version of The Black Cat, and tiny coffin-shaped copy of The Premature Burial. Grim daguerreotypes and compositions transported our imaginations back to the grim lifestyle of the Puritans during the period of witch trials. A quote from Poe, expressing the grim darkness that plagued his life and trickled into his literary works, as well as a blown up picture of his daguerrotype. By exploring both the Salem Witch Trials and the works of Edgar Allan Poe in the context of imagination and idealization, as well as how our own imaginations are impacted by literary works, the students were able to make connections between two separate points in history. By exploring a common theme in the light of two different time periods and multiple different authors, parallels can be drawn between idealization and works of art and literature.